I’d like to invite area residents to attend my next town hall meeting on Friday, June 10, in Juniata County. The meeting will take place from 9 a.m. to 11 a.m. at the Walker Grange Hall, Mexico. A continental breakfast will be served. Residents planning to attend are asked to RSVP to 717-242-2410 by June 3. Town hall meetings provide a valuable opportunity for us to have a candid conversation about the concerns and issues affecting them. By talking we can make sure state government is working for our community and remind everyone about how my office can help them with certain services. 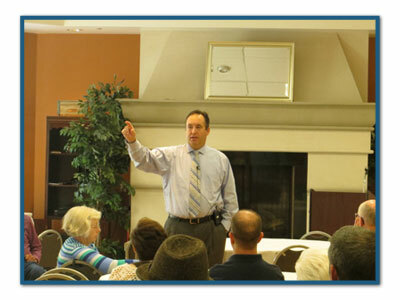 Senator Corman talks with area residents during a recent town hall meeting. I’m pleased to report that our Senate district will benefit from two initiatives that will bring new jobs and opportunities to this area. Geisinger Lewistown Hospital will finally receive its $3 million state economic growth initiative grant to renovate and upgrade its Emergency Room and Imaging Services Departments. The total project cost is estimated at $20.2 million, and work is expected to be completed by the end of August. Another economic development project is now underway in Centre County. The Pennsylvania Senate voted unanimously to transfer a parcel of land that formerly housed the Philipsburg Hospital to the Moshannon Valley Economic Development Partnership. Passage of Senate Bill 1232 will pave the way for economic development and job creation in Centre County by taking a vacant property and returning it to the tax rolls. The bill now goes to the House of Representatives for consideration. Philipsburg Area Hospital closed in April 2006 and the complex was torn down in 2014, leaving land that would be ideal for business development. Bringing in new companies will mean jobs for area residents. This is a great opportunity to recycle and develop an unused resource and turn it into a community asset. Moshannon Valley Economic Partnership that will help bring new jobs to the area. The governor recently signed into law legislation I strongly supported that would require most first-time offenders of Driving Under the Influence (DUI) to install ignition interlocks on their vehicle for at least one year. The legislation would require convicted first-time offenders with Blood Alcohol Content (BAC) of 0.10 percent or higher to use ignition interlocks for at least 12 months. Under current law, the requirement applies only to second and subsequent offenders. This measure will save lives by preventing repeat drunk driving attempts. The installation of ignition interlocks will allow drivers to use their vehicles for work, school and other purposes in a controlled driving environment. It has been widely lauded by members of law enforcement since it is smart on crime. The families and friends of DUI victims who supported this bill through the legislative process should be proud to know that their efforts strengthened our DUI laws and made our roadways safer throughout Pennsylvania. The Pennsylvania Fish and Boat Commission (PFBC) has created a new webpage to submit questions and opinions about the Commission, fishing and boating, and the Commonwealth’s aquatic resources. Known as 'The Fishing Hole,' the new webpage invites the public to share their thoughts on topics such as Fishing/Stocking, Fishing Regulations, Boat Registration/Titling, Boating and Access Areas and more. for the new Preschool Classroom at St. Paul’s Preschool in State College.